Happiness, gratitude, comfort, triumph, wishes fulfilled, inspiration, abundance, rewards. Penguin is proficient at diving deep down beneath the surface of common perception to access what is needed in bringing dreams to fruition. Determined and insightful, he is your guide in the unfolding of a bright future. Penguin may not be able to fly, but that doesn’t keep him from soaring. His gratitude radiates, casting a wave of awakening across the sky. Enjoy the rewards of your past efforts. Remain appreciative of good tidings, and take flight into new scopes of your being. With the power of inspiration, you are the master of building your own reality. 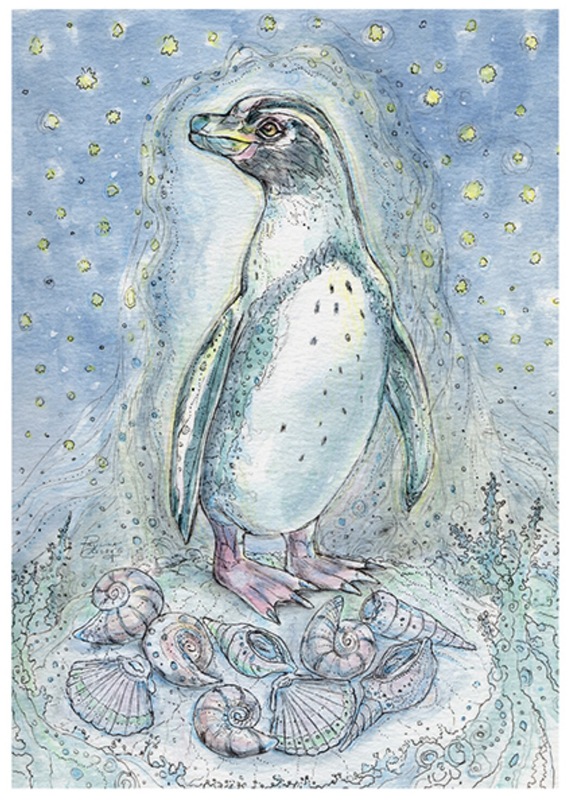 This entry was posted in Artist, Deck Review, Featured Card of the Day, General Tarot, Readings and tagged 9 of Shells, Paulina Cassidy, Penguin, Spiritsong, Tarot.